Goddess Lakshmi is the consort and shakti, or potency, of Lord Vishnu. Lakshmi, or Sri when she is especially known as the goddess of beauty (though sometimes considered to be separate entities), is the Goddess of fortune, wealth, power, and loveliness. Wealth means not only money, but also the higher values and qualities of life. The power of the mind and intellect is also a must if one wants to be truly wealthy, which includes spiritual wealth. These are prerequisites to attaining spiritual knowledge. This is why Lakshmi is worshiped in the second set of three days during the Navaratri festival before the worship of Sarasvati, which is explained later. As the spouse of Lord Vishnu, she appears whenever He does in each of His appearances, such as Vamana, Parashurama, Rama, or Krishna. In each of these appearances, she appeared as Padma or Kamala, Dharani, Sita, and Rukmini respectively. They are inseparable. Lakshmi is seen as exceptionally beautiful, standing on a lotus with four hands, two of which hold lotus flowers, and the lower right offering blessings of fortune, and the lower left held in the upright mudra or posture of benediction or blessings. The lotus she carries in her hands represents that the realization of the Self is the supreme goal of life. They also indicate the various worlds and living beings in different states of development or evolution. 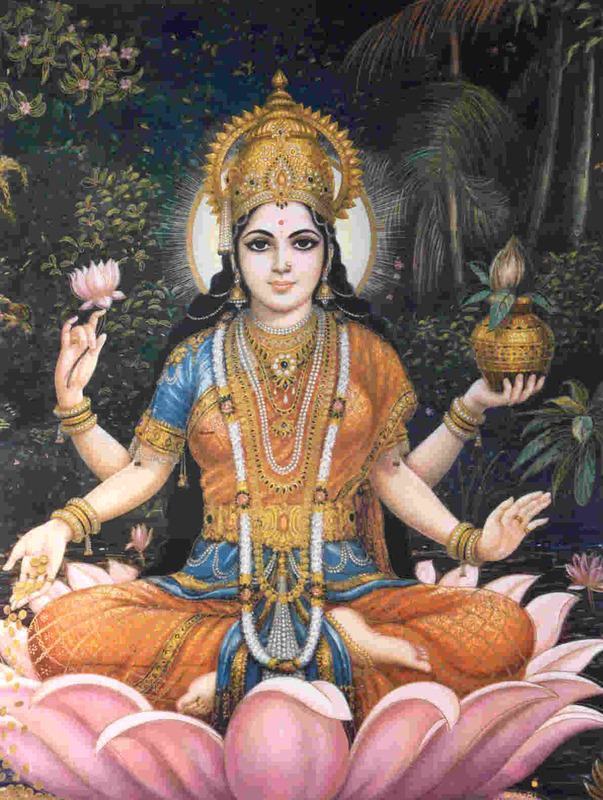 Sometimes she may be holding a potted coconut in one hand, which is another representation of Lakshmi. However, when she is in the company of Lord Vishnu, she can be seen with two or four hands. Her four hands indicate the four main blessings of human existence, namely dharma (acts of righteousness and duty), artha (wealth), kama (sensual pleasures), and moksha (final liberation). She always wears a lotus garland, and is often seen with elephants on either side of her offering items such as garlands or pouring pots of water over her, which in turn may be presented by celestial maidens. Her complexion is often dark, or white, pink, or golden yellow. When her complexion is dark, it represents her connection with Lord Vishnu. When she is seen as golden yellow, it represents her as the source of all fortune and wealth. When it is white, she is seen as the highest mode of nature from which the universe has sprung. And when seen as pinkish, it represents her mood of mercy or compassion toward all creatures since she is also the mother of all beings. Occasionally you can see her in a temple of her own, rather than accompanying Lord Vishnu. When this is the case, she is seen sitting on a lotus throne with her four hands holding a padma (lotus), shankha (conch shell), amritakalasha (pot of nectar), and a bilva fruit. The pot of nectar indicates the blessings of immortality. The fruit that she holds represents the results of our labors or actions, which comes from her blessings. When such fruit is a coconut, it indicates that she is the source of the three levels of creation, namely the gross, subtle, and the imperceptible. If it is a pomegranate, it means that all the worlds are under her influence, which she is beyond. And if the fruit is the bilva, which is healthy but not very appetizing, then it means the blessings of moksha, liberation. When she is shown with eight hands, she also holds a bow, arrow, mace, and disc. However, this is actually an aspect of Durga as Mahalakshmi. Other names for Lakshmi include Hira (jewel), Indira (powerful one), Jaladhi-ja (ocean-born), and Lokamata (mother of the world). However, she is also called Chanchala, which means fickle or never in one place for long. This signifies that fortune or wealth often does not stay with anyone for extended lengths of time. Only with the greatest of respect for Lakshmi will she stay in one’s household. This means not only offering her worship, but also taking care of not letting her go too easily by spending money on unnecessary items or projects. In some depictions of her, she is seen riding an owl, which in Sanskrit is uluka, another name for Indra, the king of heaven. Thus, she rides on the king of the gods, the holder of all the material wealth and power that a living being could want in this world, which is still not the spiritual world. In her first incarnation, Lakshmi was the daughter of the sage Bhrigu and his wife Khyati. She was later born from the milk ocean when it had been churned by a cooperative effort of the Devas (demigods) and Asuras (demons). This can be read in the Bhagavata Purana in Canto Eight, Chapters Six, Seven and Eight. In summary, the demons and the demigods had been struggling with each other. Because the demigods had offended and been cursed by the sage Durvasa Muni, they had lost their heavenly kingdom when they were defeated by the demons. Thus, the demigods went to Lord Brahma to explain the situation. They all in turn went to offer prayers to Lord Vishnu, who, being pleased with them, advised them what they should do. Carrying out these instructions, the demigods made a truce with the demons so they would work together to churn the huge ocean of milk, by which the nectar of immortality would be produced, which they all naturally wanted. Many other things would also come from this churning, such as a powerful poison that Lord Shiva would ingest. Thereafter, among the other things, was Lakshmi, the goddess of fortune. She was worshiped by the great sages and demigods, but she could find no one to be her husband, so she selected Lord Vishnu who gave her a place to always stay. In this world, the most important blessing necessary for men, women, and children alike is Maha Lakshmi kataksham, or the most loving grace of Sri Maha Lakshmi, our beloved Divine Mother. The worship of Sri Vara Lakshmi on Vara Lakshmi Vratam (July 31, 2009) bestows good health, knowledge, good discrimination, family welfare, noble positions, fame, prestige and wealth. In addition to Vara Lakshmi Vratam, the four Tuesdays through August 6th are known as Shravana Mangalavaras, and are very powerful days for the worship of Gauri Devi, the Divine Mother and consort of Lord Shiva. In this Shravana Masa, the four Fridays are most important for the worship of Sri Maha Lakshmi. Goddess Sri Maha Lakshmi is Aishwarya Pradayini, the bestower of every kind of true wealth, whether financial, spiritual or emotional. Sri Lalitambika Shakti Pitham is the most powerful and auspicious seat of Goddess Sri Lalitambika. This pitham is a uniquely powerful temple which has been constructed in Penusila Kshetram. Sri Lalitambika is the embodiment of the three main energies of Divine Mother, known as Sri Maha Lakshmi, Sri Maha Saraswati, and Sri Maha Shakti. During the most sacred month of Shravana, numerous powerful worship ceremonies will take place in this Trishakti Pitham. These unique ceremonies will attract Mother Lakshmi’s powerful divine radiance, bringing her abundant blessings to Mother Earth for the benefit of all beings. Each and every one of the eight forms of Lakshmi will be worshipped in loving detail, so that her blessings will pour down like a rushing river of pure, nectarean milk. There are many meanings to the word “Sri;” one among them is simply “Lakshmi.” In order to please Mother Lakshmi and receive boons from her, these four Fridays during Shravana are most auspicious. Those who worship Sri Maha Lakshmi on these four days with utmost devotion and dedication are sure to receive her most compassionate grace. Though we normally refer to “Ashta Lakshmis,” or her eight main forms, Mother Lakshmi actually comes in numerous forms to bless her children. Some of the most important forms follow. Those who live their lives in an unrighteous manner and without following appropriate rules and regulations can regain their lost grandeur and radiance through the worship of Sri Lakshmi Devi during Shravana Masa. Sri Gaja Lakshmi is seated upon a royal and majestic white elephant. When worshipped, she will bestow on you the incredible strength of the elephant, which is the very symbol of rightful strengh and power. You will also be graced with Lakshmi kala, the beautiful radiance of Goddess Lakshmi. The worship of Moksha Lakshmi removes all attachments and bestows moksha, or liberation, upon the worshipper. Sages such as Suka and others also worshipped Sri Moksha Lakshmi Devi. Success brings about peace of mind. Sri Jaya Lakshmi Devi gives success in all endeavors and graces the worshipper with karya siddhi, the successful accomplishment of any task. The foremost boon that Sri Rajya Lakshmi Devi bestows upon her worshipper is adhikaram, the power and right to rule. The worship of Sri Rajya Lakshmi Devi confers position, power, pride, and a high and noble life in society. This worship also bestows you with success in all endeavors. When a person gets married in accordance with dharma and with God as witness, then Sri Gruha Lakshmi Devi herself is installed within the housewife. Such a blessed wife fills her home with love, good behavior, and every auspicious energy, which blesses her family eternally. But in any home where Gruha Lakshmi does not dwell, one will find worries, loneliness, weakness, violence, anger, anxiety, darkness, and loss of wealth. When one worships the eight forms of Sri Maha Lakshmi Devi in Shravana Masa, then Sri Gruha Lakshmi Devi fills one’s home with the divine effulgence of her love, and grants one complete peace and happiness. When Sri Adi Shankaracharya worshipped Sri Lakshmi Devi with Kanaka Dhara Stotram, a hymn for the grace of rain, Sri Lakshmi Devi blessed him with the rain of gold. Thus, the worship of Sri Lakshmi Devi will bless you with the rain of all fulfilled desires. When you worship Sri Santana Lakshmi Devi, she will protect the well-being of your children. She will take gentle care of all your children and bless them with growth and success. Sri Dhanya Lakshmi Devi resides in all her glory in grains, fruits, and all vegetables. When you worship this form of Mother for removal of hunger and for blessings of plentiful food supplies in your home, the Goddess will bless you so with her abundant grace. Sri Saundarya Lakshmi Devi resides in all the decorative ornaments in your home, and graces your physical body with beauty, radiance, and divine effulgence. When you worship this Goddess, she will remove all the inauspicious forces challenging you and make your face glow with Lakshmi kala, the radiance of all auspiciousness. Six days after an infant is born, Sri Bhagya Lakshmi Devi takes the baby onto her lap and writes upon the infant’s tender forehead the bhagya rekha, or the “line of good fortune.” Sri Bhagya Lakshmi Devi can completely alter the fate of an infant as ordained by Vidhi, the Creator, by overwriting this with her own bhagya rekha. Worship of this Goddess will ensure that adrishtam, the unseen energy of good luck, follows one at all times. Sri Suddha Lakshmi Devi removes all obstacles for receiving the wealth that rightly belongs to you. She showers you with all types of prosperity and graces you with purity. You may worship this Goddess and receive her abundant grace. Human beings tread upon the two feet of shanti, peace, and ashanti, peacelessness. Those who worship Sri Lakshmi Devi in Shravana will obtain absolute peace from Sri Shanti Lakshmi Devi. She will remove any vulnerability or weakness, ill health, and inner turmoil, and at once shower the worshipper with her krupa, her divine compassion. A varam, or boon, is a divine gift that is obtained in an incomprehensible and completely surprising manner, at a time when you thought it could never be obtained. Sri Vara Lakshmi Devi is the Goddess who confers upon you such boons that you never thought of or imagined. When you worship Sri Vara Lakshmi Devi for four Fridays in the month of Shravana, then Sri Vara Maha Lakshmi Devi will bless you with the fulfillment of all the boons that you desire. The worship of Sri Vara Lakshmi Devi will enable you to attain even sashvata vidya, eternal knowledge. Sri Saraswati Devi is none other than Vidya Lakshmi, who grants her worshippers this eternal knowledge. With the grace of this Goddess, even a complete illiterate can be transformed into a pandit, a wise person of eternal knowledge.